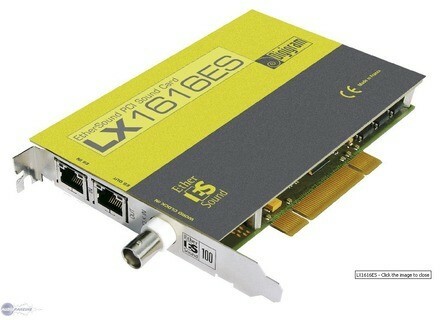 LX1616ES, Internal PCI/ISA Sound Card from Digigram. Digigram presented the LX1616ES PCI network sound card with DirectSound and ASIO drivers for the very first time at Prolight & Sound 2008. Little sister to the LX6464ES sound card which was designed to exchange simultaneously 64 channels from and 64 channels to an EtherSound network, the LX1616ES can transmit and receive up to sixteen EtherSound channels, thus connecting computer-based audio applications to a 100Mb/s EtherSound network via a single CAT5 cable. According to Digigram the LX1616ES is the perfect choice for direct-to-disk applications that don’t necessarily require as many as 64 channels, but still require maximum flexibility to play and/or record selected ES-100 audio channels using just a single CAT5 cable. A scaled-down version of the LX6464ES, LX1616ES offers an starting point for price-sensitive applications, particularly since it can be upgraded from a 16/16 channel count to 32/32, 48/48 up to 64/64 through simple firmware updates. The manufacturer tells us that in a live sound environment, the combination of a PC equipped with an LX1616ES (or LX6464ES) soundcard and an EtherSound-enabled digital mixing console results in an extremely powerful, high quality and extraordinarily cost-effective multitrack recorder. Entire shows can be recorded for mix-down at a later date, and musicians can be replaced by recordings for enormous time savings during sound-checks. The implications of this technology in the world of live recording and live production are extremely compelling. [Musikmesse]Future Audio Workshop Circle Future Audio Workshop announced the launch of Circle which they describe as a fresh look at software synthesis. Circle works as standalone, Audio Unit, VST and RTAS. [Musikmesse] Glyph Technologies Portagig Glyph Technologies presented their latest Portagig drive which was upgraded with two FireWire 800 ports, an internal SATA II drive, Oxford 934 chip, and a rear power switch.